Fishing can be such a fun, family-friendly activity. It can be educational and a bonding experience. But for something that was a commonplace activity years ago, the number of families that now engage in the old favorite pastime and pass down the knowledge of fishing is far less than what it used to be. There are a number of reasons for this, including less outside time in nature and more time being spent indoors with screens and other technology based equipment, as well as moral conflictions that are more present today with fishing and hunting. There can also be some fear in the unknown, and in any activity that has a “danger” element attached to it when it comes to involving our children. If you’re reading this post though, then you have probably already made up your mind on any moral issues related to fishing, so let’s get on with the good stuff! 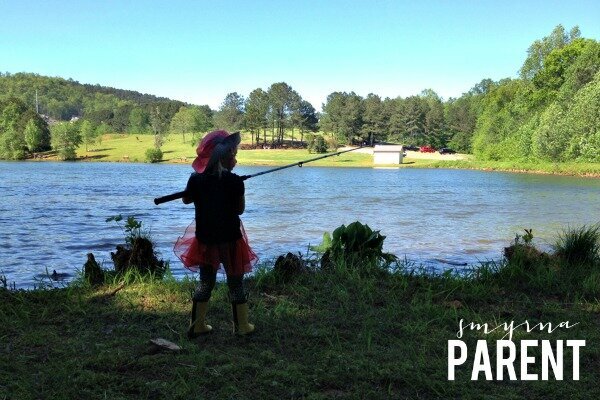 If you’ve been thinking about introducing a young child to fishing but have been feeling a little nervous about it or aren’t quite sure how to start off, then I’m here to help with some tips on gear options, locations, and more. While I’ve seen it mentioned in more place than one that you shouldn’t teach a child under 5 years to fish, I’m calling baloney on that! A young child that gets frustrated by the experience may not learn to love fishing, so the key is to be prepared for the experience, have fun, and keep it simple. Knowing your child and their abilities, while following their lead on something like this also plays a big role in the experience. 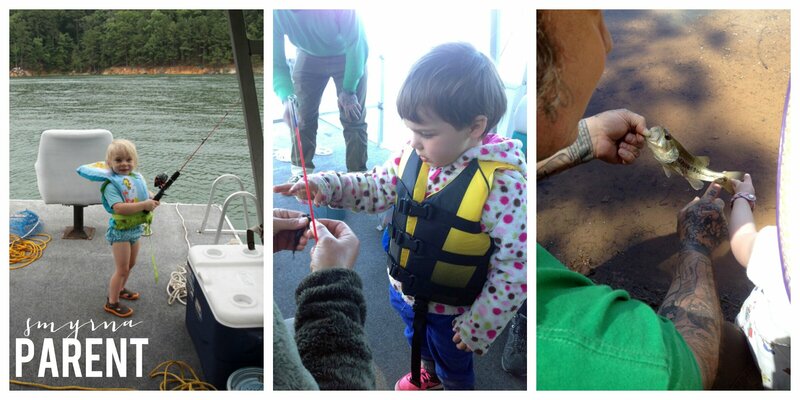 We would take our daughter fishing with us when she was under one year old, and at 2 ½ she started fishing on her own. We always bring her pole with us now, and she decides whether she’d like to fish with us, or just splash in the water and play. – Keep it simple and fun- there’s no need to start off with fancy techniques, trying to catch specific species or sizes (they will be excited to catch anything! ), or offering over-solicited advice. – Follow their lead- if they become no longer interested in fishing after 15 minutes, let them stop, don’t push them to keep going or it will kill their enthusiasm for it. – Be prepared- pack plenty of water to drink, snacks, sunscreen and hats. Being thirsty or sunburned can ruin an afternoon of fun. – Be patient- they will need some help and you may have to keep re-baiting their hook. Don’t get frustrated or annoyed, they’ll be able to sense it and will feel it too. – Share in their excitement and achievements (no matter how big or small) and give them some space to do it on their own (don’t hover). – Let your child make some of the decisions- let them pick out their own tackle or buy a special piece of gear themselves. Allow them to help you decide which spot is a good one to fish from, and how long they want to stay. – Please remember to take home anything that you went out there with, especially hooks and cut fishing line that could injure another being. Hooks seem to be a bit scary for people that don’t fish regularly, or aren’t comfortable with their children managing sharp objects. I’ll start off by mentioning that allowing your child to take and manage some risks is a good thing, and this would be a perfect opportunity to teach them about handling sharp tools with care and to practice being aware. Letting them bait their own hook takes it a bit further, but can also help them understand how important it is to be careful, especially if they end up nicking their finger on a sharp end… they are much less likely to do it again and to be more aware of making sure others don’t get stuck. Now if the hook is still outside of your comfort zone, then try some hide a hook bobbers. These bobbers “hide” the hook inside them when the line is reeled in and out of water, and will drop the hook once you cast, making it next to impossible to hook yourself or others while casting. The downfall is that the hook doesn’t sink as deep into the water because of the bobber. If you feel like your child is ready for a real hook, then choosing one without a barb on the end is a good idea, or you can bend the barb down. If on the chance that someone does get “hooked”, then it will be easier to remove than a barbed one, and is also easier to remove from a fish without hurting it if you’re doing catch and release. Bait options include earthworms, minnows, or even hot dog pieces if you prefer not to fish with live bait. You may also choose a lure with hook attached, so that baiting your hook isn’t necessary. If any type of hook is still outside of the question, then you can always add a practice plug to the end of your child’s line. They of course won’t actually be able to catch a fish with it, but they can still enjoy the act of casing and reeling in. Your pole options for kids are: a kid-specific character pole (I’m sure you’ve seen the ones I’m talking about with a Disney princess or superhero branded all over them), a simple cane or bamboo pole, or a shorter size regular rod and reel. Most people purchase a character pole for their child, because it’s marketed specifically for kids and that’s what you’re supposed to buy them, right? 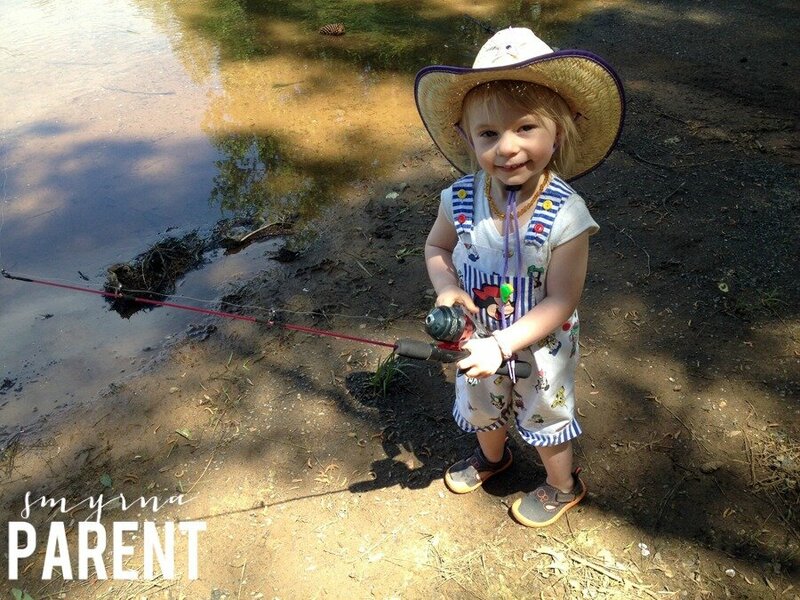 If you’re trying to get them interested in fishing and they aren’t already excited about it, then having their favorite character gear can definitely help with the excitement of it. Other than that, these poles generally aren’t made as well as some of the smaller size regular ones that will last longer and are built better for the same price. The way the reels on the character poles are built lend the line to get easily tangled, which ends up creating a lot of wasted line and time to cut it off and retie. I recommend a 2-3 ft. rod and reel set like the Dock Demon. A cane pole is just a stick pole with no reel. These are a cheap and super simple option if you aren’t ready to teach casting and reeling in, or if you need to buy poles in bulk. If you plan on fishing more than a few times though, getting a pole with a reel on it will benefit your child better long term. If your child really loves fishing, getting a few practice weights/plugs makes it easy for them to practice or play with it at home. You can even set up an obstacle like a bucket, for them to aim for when casting. Luckily in the state of Georgia, children under 16 years old do not need a fishing license. If you plan to fish with your child though, then you will need one. You can read more about the GA license requirements here. For Cobb residents, you have multiple great fishing options in the area. Lake Allatoona, Lake Acworth, and Sweetwater Creek State Park are a short drive away, are stocked with a variety of fish species, and have lots of additional activities to partake in, which makes it easy to make a day of it. Allatoona and Sweetwater both have on-site or nearby (seasonal at Sweetwater) bait shops, and Lake Acworth and Sweetwater only allow trolling motors on boats on their lakes (no gas motors). All three require parking fees. For shorter fishing trips, Lost Mountain Park on Dallas Hwy is a great choice for catch and release (this lake doesn’t seem as clean as the larger ones, so I personally wouldn’t eat anything from it). This lake is a bit hidden in the park and not as many people know about it, but it has some great hiking trails and a small lake perfect for fishing with kids (no boating or docks). It’s free to fish and park here since its part of the Cobb County Parks system. Another close by option is GB’s Lake on Hurt Road in Smyrna. They offer boat rentals (non-gas), they sell bait and tackle, and are stocked with a few varieties of fish. It’s a nice quiet lake but only open four days a week, and costs a couple of dollars to fish at. Want to try some fly-fishing or catch some trout? Then Cochran Shoals (Chattahoochee River National Recreation Area) is also close by. You will need to purchase a parking pass, and follow their fishing regulations which are a bit different than some of the other parks. If you’re looking for more of an educational fishing experience, then plan a family field trip to Go Fish Education Center in Perry, GA. You can view a hatchery and freshwater aquariums, view aquatic wildlife and habitats, play with the interactive fishing simulators, learn about various types of tackle and native fish, learn to tie nautical knots, fish in their stocked catch and release pond, and lots more. They provide the fishing equipment here and you don’t need a fishing license. You do have to pay admission, but the Cobb County Library system (and I believe all libraries in Georgia) also have passes that you can check out if you have a library card, which will get you in for free. 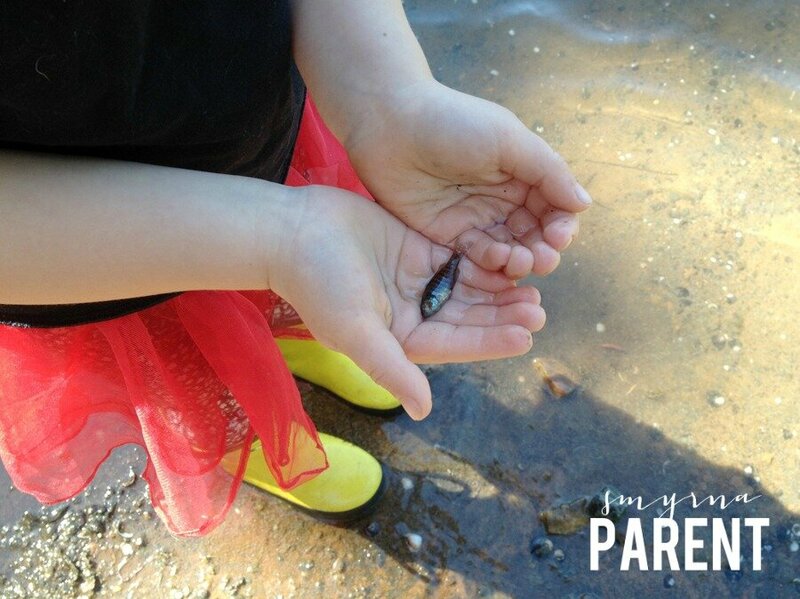 The Buford Fish Hatchery is another good “field trip” destination that has tours and a catch and release family pond. – The Georgia Department of Natural Resources’ Wildlife Resources Division provides select Georgia State Parks with a Fishing Tackle Loaner Program. It offers fishing poles and stocked tackle boxes to visitors to use for FREE. This is a great thing to take advantage of if you’re not quite sure fishing is right for your family but want to test it out before purchasing any gear. Red Top Mountain located on Lake Allatoona is one of the participating parks. 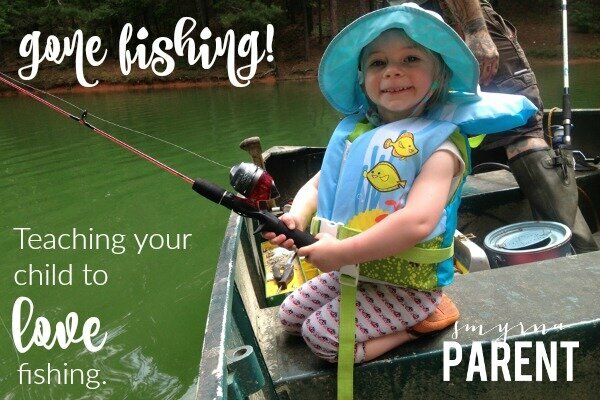 – GA DNR has a “My First Fish Award” that you can print out and fill in to honor your little ones first catch, and also lists upcoming kids fishing events on their site calendar. – If you are new to fishing yourself, then reading up on things like how to bait a hook, how to reel in a catch, how to release a fish, etc. can be extremely helpful. For example, certain fish need to be handled in specific areas of their bodies, as their fins can be sharp and can cut your hand. This site has loads of information on more of the “how to” of fishing and details for beginners. – Adding a book about fishing into your child’s story time can add another layer of excitement and education to the experience. One of our favorites is A Good Day’s Fishing, by James Prosek, which is available to check out through the Cobb County Library System. – Ever wonder what happens to the fish that get away with your hook still stuck in their mouths? A new study reveals some surprising (and comforting) results. 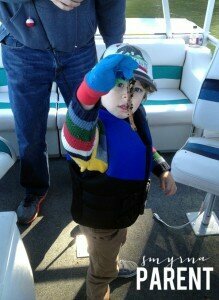 Ready to Introduce your Child to Fishing? This event is free, but you’ll have to provide your own gear and tackle. And it is an open event, so you do not need to be a member of Wildwood to participate! Please click on the link above to learn more and RSVP. Wonderful article about fishing for kids, and a great help if you want to teach your kid how to fish. And I loved the pictures of Gemma fishing.